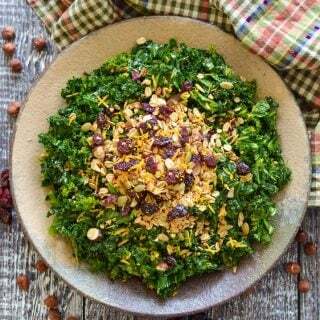 This healthy Massaged Kale Salad is dressed in a deliciously tangy orange vinaigrette then scattered generously with savoury granola which is, for the record, THE perfect salad topper. Period. 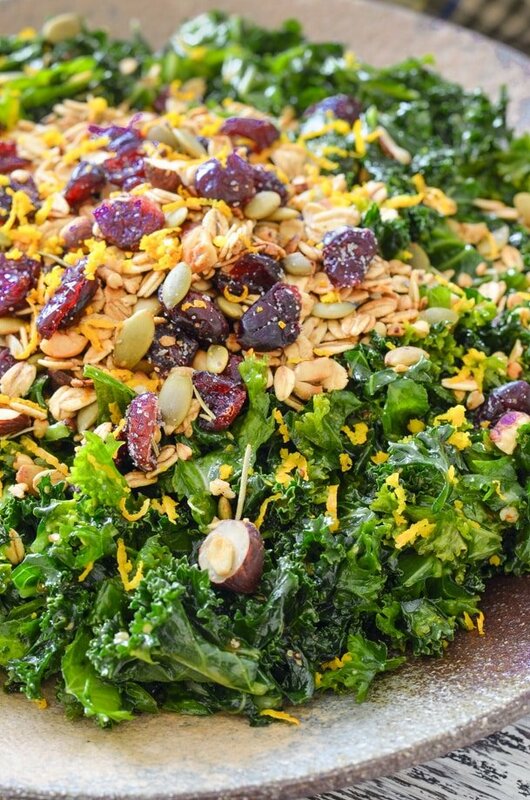 Massaged, Kale, Salad and Granola all together in the same recipe title. I think I might have just crossed a line. But I don’t care. 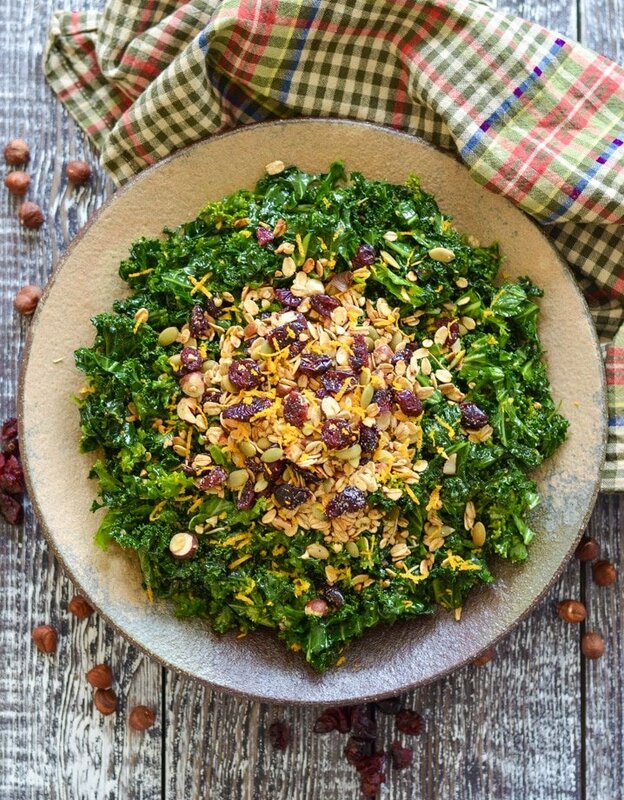 I love this Massaged Kale Salad with Savoury Granola and I’m sure you will too. ???? We’re talking finely chopped kale massaged in the tangy orangey vinaigrette until soft and yielding. Savoury granola made with a delicious mix of all things crispy, nutty and chewy, plus a generous amount of salt and dried rosemary to bring it together. We’re talking about piling that granola on top of your Massaged Kale Salad to create a really satisfying texture and amazing flavour. It’s just perfect, plus it’s stuffed full of healthy ingredients. Perfect to balance out all of those Sticky Lemon Strawberry Sweet Rolls we have been eating since I published them earlier this week! Ok, now the weird part. ???? If you had told me a few years ago that I would be massaging kale ??? ?….I mean c’mon?! It does sound ridiculous. BUT, I have since learnt that the key to a good kale salad, a kale salad that people actually like to eat, is taking an extra minute or two to massage the kale. It’s so easy. Whenever you make a kale salad, gently massage it with a little of the dressing, or a drop of olive oil until it becomes soft and darker green. It will shrink too so be prepared for that. While the massage and shrinkage is happening, it relaxes it up beautifully and becomes soft and really delicious. It is so worth it! I am sure we have all experienced a kale salad that hasn’t been massaged. It can leave you chewing for ages like a horse chewing hay.???? That will not be happening here! This salad is perfect for all of your summer BBQs, cookouts and potlucks and it’s also great for packed lunches. I have also been known to eat it for breakfast…Why not? It does involves granola! ???? I hope you enjoy it. As always share you pics with me on Instagram. I would love to see them. I am @avirtualvegan and my hashtag is #avirtualvegan. Zest and juice the orange. Put the juice, zest and all of the other salad dressing ingredients either into a small bowl or a clean lidded jar. If in a bowl whisk together to combine, if in a jar just give it a good shake. Add the maple syrup if you think it needs a little more sweetness. I like to use a jar because it's easier and any leftovers can be stored in it in the fridge. In a bowl, add the oats, buckwheat, hazelnuts, pumpkin seeds, salt and pepper. Add 60mls/¼ cup of the salad dressing and stir really well. Tip out onto a lined baking sheet and bake for 10 minutes. Remove from the oven, shake around a bit then return to the oven for around another 10 minutes. It might need a few minutes longer to go dry and crispy. Watch it to make sure it doesn't burn. Once removed from the oven, add the rosemary and cranberries on to the tray and mix them in while it is still warm. Taste and add more salt if needed. I added a little more as I like a salty edge to mine. Wash the kale leaves and remove the stems. Chop into small bite sized pieces and put into a large bowl. Add the salad dressing. You might not need all of it. Just enough to coat everything nicely. Then, get your clean hands in there and massage and rub the kale for a few minutes until it starts going darker in colour and becoming soft. 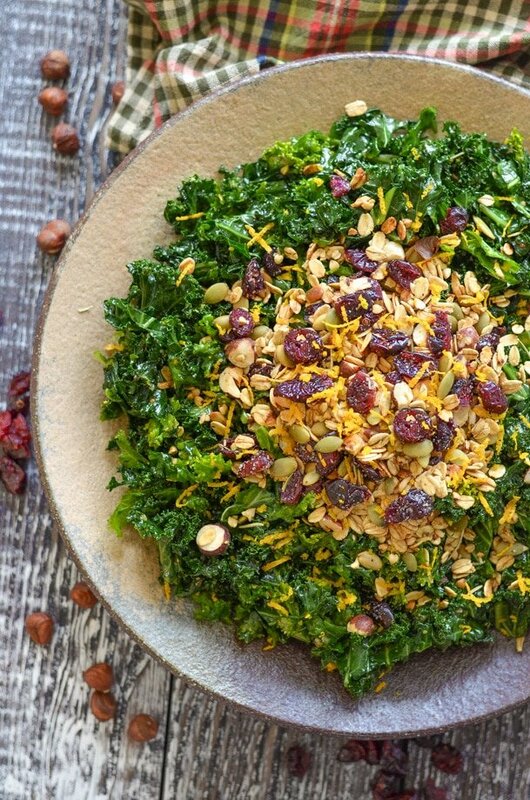 Serve the massaged kale with plenty of granola topping. Leftover salad dressing can be stored in the fridge in a sealed container for up to a week. You will probably have some granola leftover. Store it in an airtight container. Use it on salads, avocado toast, sprinkled on soups, or just for snacking. The massage kale can be stored in the fridge for up to 2 days. It doesn't go slimy like dressed lettuce salads do. Keep the granola separate until serving to keep its crispy texture. I seriously think I could eat this salad and nothing else for the rest of my life…..so GOOD!!!! Thank you!! Thank you Kelly. I’m thrilled you are enjoying it so much! I am a convert to massaging kale. It makes such a difference. It’s hard to believe until you do it and see the difference. Try it soon!